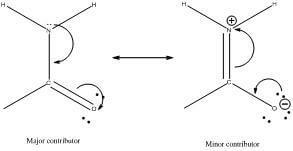 How do I draw a Lewis Structure? Let's go step by step and demonstrate using CO2 as an example. Remember: Valence electrons are the electrons in the outermost shell of an atom. Some valence electrons participate in bonding to another atom. Others, known as lone pairs, do not. How do I figure out an atom's formal charge? Use what you learned in Part Four to complete the following exercises. For this exercise there are two covered windows. Determine the formal charges for the Nitrogen, Carbon and Oxygen atoms in the structure. We recommend you draw your response on plain white paper. When ready, click on the window to reveal the answer. For a detailed explanation, click on the window in the "Explanation column" when ready. For this exercise there are two covered windows. 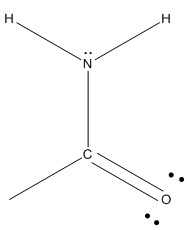 Determine the resonance contributors to the structure drawn. After they are drawn, label the major and minor contributors. We recommend you draw your response on plain white paper. When ready, click on the window to reveal the answer. For a detailed explanation, click on the window in the "Explanation column" when ready. Since you need to add one to four to get to 5. Since you need to add 0 to four to get to 4. The major resonance is chosen to be the left image because it is the structure with no separation of charge. 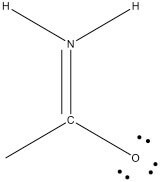 One can easily appreciate that the minor contributor drawn has the charge separated with a +1 formal charge on the nitrogen and a -1 formal charge on the oxygen. This is considered separation of charge. 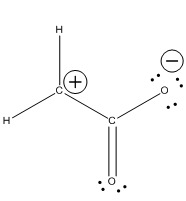 Minor resonance is chosen to be the right image because it is the structure with a positive charge on the most electronegative atom in the structure (oxygen).